WhatsApp is the ultimate instant messaging service, especially in India. From kids to parents, everyone who has a smartphone uses WhatsApp every day to connect with their loved ones. 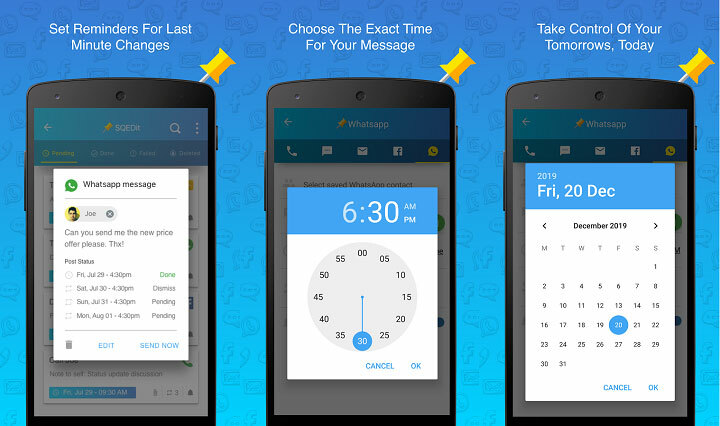 WhatsApp has a ton of features, but one thing that it lacks right now is the ability to schedule your texts. Not that the lack of this feature is a deal breaker for anyone, but it could prove useful if you have the habit of forgetting to send an important text at a particular time. Anyway, even though WhatsApp doesn’t natively support scheduling of messages at the moment, there are a bunch of third-party apps that do so without any hassle. These third-party apps act as add-ons and work along with the main app i.e. WhatsApp. 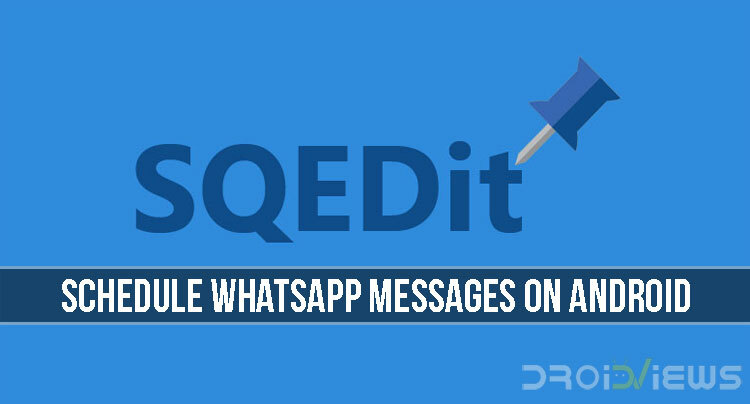 The app we will be using to schedule WhatsApp Messages is called SQEdit Scheduling App. The app will now ask for accessibility permission which it requires to work properly. Grant it. If you deny the permissions accidently, you can go the Settings app on your device and grant permission from there. ‎Once the permissions are dealt with, open the app again and tap on the WhatsApp icon. Here you can schedule your message i.e. write the content, select the receiver, set date and time, etc. Once you are done, tap the “Schedule” button at the top right corner to save and schedule the message. ‎There’s a “Send Manually” button that’s turned on by default. What this means is that, just before it’s time to send the message, the app will notify you so that you can make some adjustments, if required. The message will be sent only after you allow the app to do so. If you want everything to work automatically, disable this option. The app does what it’s supposed to do and it does so better than the other apps of its kind. However, there’s one thing you should know – in order for the app to send messages, your phone has to be unlocked. Due to Android policies, apps are not allowed to bypass the lock screen. Hence, your phone needs to be unlocked so that the messages are sent automatically. 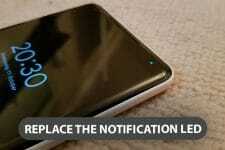 If your phone’s locked, the app will notify you to unlock the phone at the scheduled time. As soon as you unlock your phone, the message will be sent. 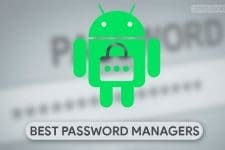 If you want the app to send messages even when your device is locked, you’ll need to grant it root permissions i.e. you need a rooted device. SQEdit, other than WhatsApp scheduling, can also schedule calls, texts, Facebook posts, and emails.